Are you Talent or just talented? | ARES, Inc. The toughest task of a business owner is usually finding, retaining and leading talent. It’s easy to look at others and see what’s wrong with their performance, especially when we’re paying them! Yet… when was the last time we looked at ourselves and evaluated our own performance? 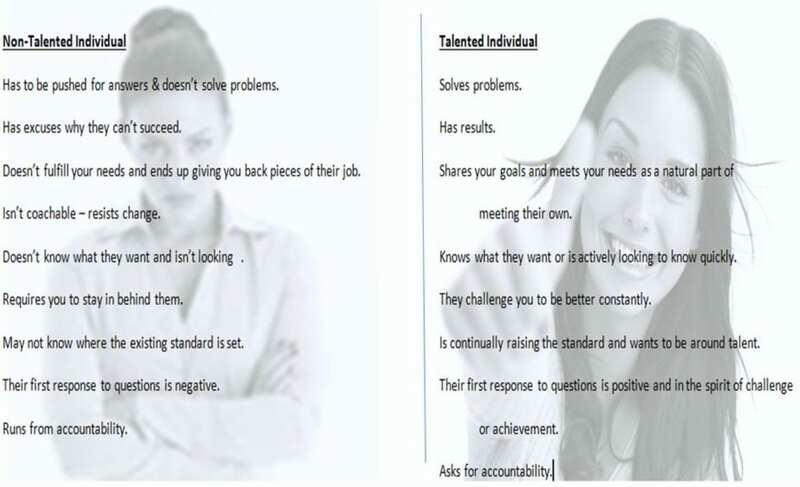 As your boss, how would you rate yourself as a truly talented individual? Now, before you start talking about how hard you work and how many hours you put in, remember – we’re in a productivity-driven business. Do the hours count if there are no results? Are you spending the right amount of time on the right activities? Is your attitude aligned with your goals? As a business development coach, I constantly hear, “I’m so busy!” Then I ask about the number of listings they have or the number of transactions they have, and both of us realize that whatever the agent is so “busy” doing isn’t translating to results. Results begin by understanding where you may need to work on your own talent first… and then evaluating the team around you. Here are the standards to begin. Take an honest evaluation and be aware this month of how you can quickly improve your own talent. If you’ve been in the business a while… maybe you need to fire yourself today, and come back tomorrow as your fresh, excited replacement. If you’re running a team – start with yourself first, then share this with them to evaluate themselves. Watch the change.